There is no real humor in the game (Unless your a serial killer).This game is difficult but no matter how hard the levels got I would not stop. What makes Ninja Gaiden such a great game is that you have to use actual strategy and tactics to beat the game. Sure, you can button-mash your way through the first couple of levels, but soon you will have to fight intelligently to survive. Not only that, but in order to get a good score on each level you will have to fight strategically. Button mashing may get you through the level, but you will not get a good score. 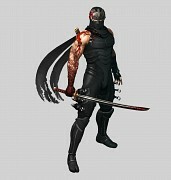 Ninja Gaidenâ€™s difficultly can be frustrating, but it does not make the game impossible. If you are having a hard time succeeding, it is because your tactics need improvement, not because the game is being unfair.